Move over, PinkBerry! Manuel Ramirez’s Chill! Berry at the Lollicup Tea Zone in the San Francisco Bay Area is a Filipino-owned business — and we’re here FIRST! Please join Manuel at his grand launch on February 4, 2008. Chill with Chill! Berry! Here’s your FREE Chill! Berry Frozen Yogurt coupon, $1 value, courtesy of Manuel Ramirez. Good till October 2008. Please print this coupon for redemption and let them know that Lorna Dietz gave this to you. I met Manuel Ramirez, this engaging, hard-working Filipino American young professional a few years ago at the GMA Pinoy TV launch in the San Francisco Bay Area. He was busy handing out these “to-die-for” Lollicup slush and smoothie beverages (dessert!) with boba (“black pearls or tapioca balls”). Feeling giddy and extra-energetic because my blood sugar was so impressed by Lollicup’s Ube (taro or purple yam) ice-creamy smoothie — I kept in touch with Manuel. He’s been one of our sponsors at the Filipinas Magazine Achievement Awards (2006), delightfully making the Lollicup products available for us to feel “Proudly Pinoy!” We’re proud to support a Filipino-owned business. Aside from being one of Lollicup USA’s regional distributors (independently-owned and operated), Manuel Ramirez offers Chill! Berry frozen yogurt. Now, my blood sugar is going to be singing praises because I’m a lover of frozen yogurt. Here’s the news from Manuel. I hope all is well. I just wanted to inform you of my upcoming Grand Opening in San Jose. The downtown store will be a dual operation of Lollicup and Chill! Berry. I’m very excited to bring this new, tart style frozen yogurt to the Silicon Valley. The product itself is very similar to the yogurt popularized by Pink Berry in Southern California and NYC. The yogurt is low-fat and made from real yogurt filled with live, active and probiotic cultures that bolster the immune system and aide the digestive process. We will be serving plain and fresh mango yogurt flavors at our opening. Best of all, we will be serving FREE small Chill! Berry yogurt (5oz. serving) from 11am-7pm on our opening date. It would be great if you could come by and visit and I would truly appreciate your assistance in helping us spread the news with friends, family and colleagues in the South Bay. Please find a coupon attachment that can be redeemed upon print out. We will be giving free yogurt on Monday, but the coupon can be redeemed any time thereafter. Also, we will have a Soft Opening and begin selling Frozen Yogurt on Thursday, Jan 31. 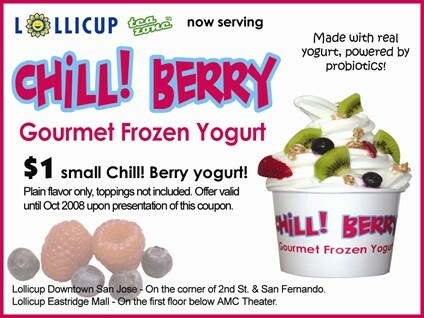 Lollicup Downtown (150 S. First St. San Jose, CA 95113) is located on the corner of 2nd and San Fernando. Just 2 blocks away from SJSU and San Jose City Hall. Pingback: Radiant View Communications » What’s Hot and What’s Coming Up? I’m quite interested in setting up a similar business here in the Philippines but I’m having a hard time in getting started (due to materials problems etc) I really think that a frozen yogurt business would be really successful here. As far as I know, there are still only 3 stores selling frozen yogurt here and they’re owned by Korean immigrants. I hope that you can help me in any way in starting my business. Please email me here: [email protected]. Thank you very much! I hope to hear from you soon. It is great to hear about the beginnings of new businesses and this post was a great example. I was wondering though, how is his business fairing now? Maybe there could be a follow up post/interview of how the grand opening and following months went.